Far more than just a glorified preset machine, iM1 is the dream app for iPad synth aficionados. Excellent range of presets. Highly versatile. New features. Seamless integration with Gadget. Intuitive interface. Premium price point. Limited filter modes. 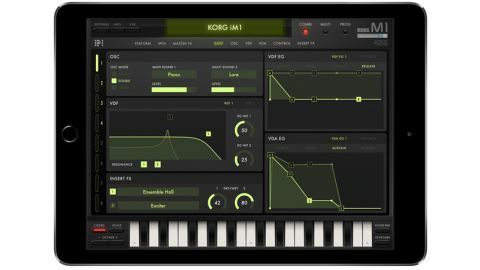 Launched in 1988, Korg's M1 workstation is widely regarded as one of the greatest digital synthesisers ever made, so its enormously successful transition to the iPad is a momentous moment in mobile music production history. In building iM1, Korg has circuit-modelled the original hardware (the manual for which is included, rather splendidly) and incorporated all of its original PCM data. It can be used as a regular monotimbral instrument or a mutitimbral sound module with up to eight timbres layered on one MIDI channel or triggered independently. In multitimbral mode, the MIDI page gives access to key and velocity ranges, amongst other things, while the Performance page makes certain core parameters of all eight timbres available together - the filters and envelopes, primarily. New features include filter resonance, amp modulation, the addition of a compressor, an improved effects architecture, and the incusion of two Kaoss pads for live performance purposes. You get about 450 presets included in six 'ROM cards', with almost 3000 more up for grabs in another 27 cards via two £3.99 IAPs, which - as Korg is no doubt all too aware - can only be described as essential. Consider the full price of iM1 to be £31, then. New features include filter resonance, amp modulation, the addition of a compressor, an improved effects architecture, and the inclusion of two Kaoss pads for live performance purposes. We're quite surprised Korg didn't also take the opportunity to work in a few more filter modes beyond the included low-pass. What hasn't been brought over from the real thing is its eight-track sequencer, although with external MIDI input, Inter-App Audio and AudioBus supported, that's no big deal. Users of Korg's Gadget can enjoy seamless iM1 integration into that app, too, in the shape of the Darwin module. iM1 is certainly premium priced for an iOS app, but when you consider that the original came in at £1500 plus the cost of the cards, it proves to be worth every penny, offering a superb library of retro basses, pianos, leads, pads, drums, electric and acoustic instruments, etc, in an intuitive interface that enables deep editing.